Royal residence, socialist city, fishing village, garrison town and currently boomtown. Situated on an island, surrounded by lakes, Potsdam is known far beyond the borders. At this place the Prussian rulers have set up their refuge, a cultural landscape was established here that is unparalleled. However, in Potsdam time has not stood still. Universities bring life to the city and the site of Babelsberg film studios produces international movie bestsellers in series. 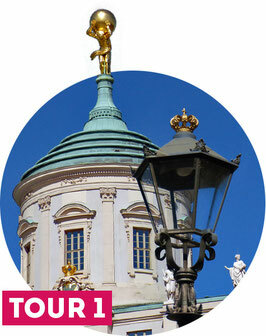 Immerse yourself in Potsdam's history with our guided city tours. 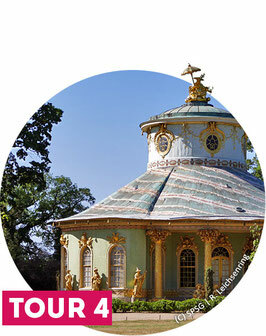 Our guides will help you experience the baroque splendour of Sanssouci and show you where Potsdam is most energetic. 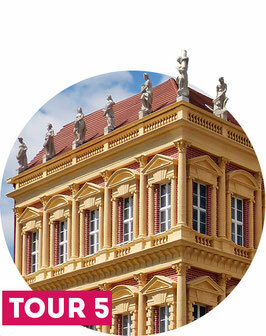 Let yourself be guided through the streets and courtyards of the city, listen to the stories behind the beautiful facades and discover what makes Potsdam unique! This city tour shows the most important sights of Potsdam city center with the royal City Palace, the Nikolai Church, the New Market, the remaining city gates and the Dutch Quarter. 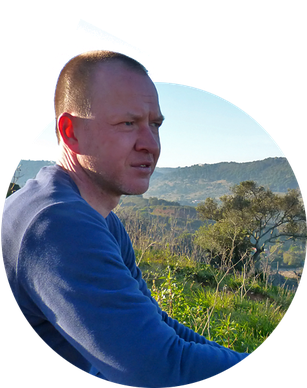 You will learn the most important details about the town's history and current plans. The Park of Sanssouci is really colossal. Keeping track of things here is not easy. We'll take a look with you at the highlights of the park on this tour. You also get to see and explain the Big Fountain, the Chinese Teahouse, the Orangery and of course the world-famous Palace of Sanssouci. Additionally an interior visit of the New Chambers can be booked. 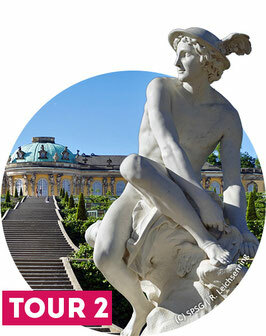 This city tour combines the Old Town Walk with a short tour of Sanssouci Park. Experience the most beautiful sights of the Potsdam center on your way to the park such as the City Palace, the Dutch Quarter or the city gates. Afterwards we discover together the core zone of the park of Sanssouci with the Church of Peace, the vineyard terraces, the Summer Palace and the Big Fountain. The Park of Sanssouci in detail. You will experience a time travel through the fashions of garden art and architecture, you can walk through ancient models of landscapes and see where the children of the emperors raged. In addition to the highlights of the small park tour (Tour 2) you will see the Roman Baths, the Charlottenhof Palace, the New Palace, the Belvedere and the Dragon House. Additionally an interior visit of the New Chambers can be booked. 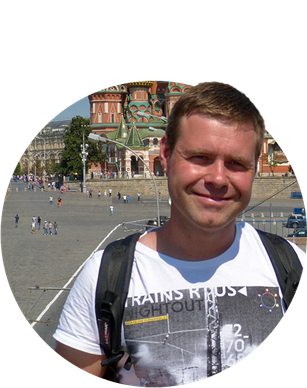 This city tour includes all major ensembles of the city center such as the Old and New Market, the City Squares and the Dutch Quarter. Of course, a look into the pretty courtyards should not be missed. You will learn more about the history of Potsdam and get to know current projects. A tram ride to the Russian Colony completes this city tour. 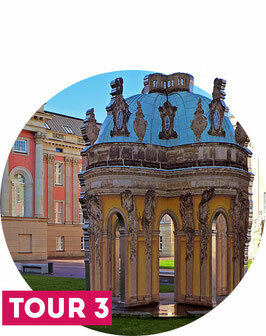 Discover and enjoy Potsdam in detail! 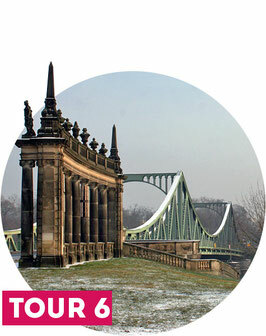 The Cold War began not least in Potsdam and at the Glienicke Bridge - world famous as a symbol of the German division. But Potsdam has even more exciting traces of the East-West conflict to offer: especially the KGB City and the Cecilienhof Palace as the venue of the Potsdam Conference of the "Big Three" (Stalin, Churchill, Truman). This city tour takes you on a journey through time to the recent past. Babelsberg stands for big cinema from Potsdam. 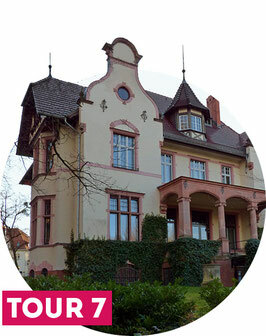 This tour shows you where the stars used to live and the first German movies were produced. You also learn that Potsdam once had a Little White House, and where Stalin invited Churchill to a dinner. 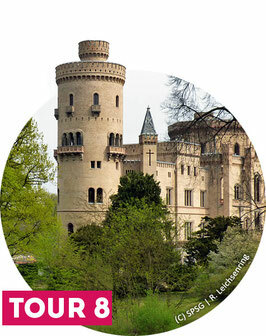 And of course the Park of Babelsberg with its magnificent Palace is not missing on this guided tour. The hilly park designed by famous garden architects Lenné and the Prince of Pückler-Muskau is like a dream. We guide you through the richly designed royal garden with its pavilions, geysers, streams, waterfalls and the neo-gothic imperial palace that brings back memories of England. The exclave Klein-Glienicke with the hunting lodge Glienicke as well as the world-famous bridge of the spies complete this green exploration trip. 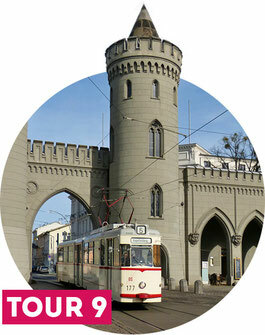 Tour 9 | Go Potsdam with a Vintage Tramway! If you prefer to experience Potsdam from the window of a historic tram, then you will get your money's worth on this tour. It goes past the sights of the city center and the Potsdam suburbs. Legendary Babelsberg is also on the timetable. For technical reasons, this tour must be booked at least four weeks before the travel date. An additional fee of 30,00 € is charged for all city tours in English. The Prussian King Frederick II. (called 'Fritz') and the Russian Tsar Peter - both known as 'the Great' - have influenced and shaped their countries fundamentally. Their significant influence is felt to this very day. Both characters combined different, seemingly contradictory properties: frequently unscrupulous against others and themselves, with military ambition in the European power structure – however also equipped with a sense of the fine arts, both independent and without question cosmopolitan in spirit. Frederick collected the world’s architecture and philosophy in his “Brandenburg Sandbox”, Peter traveled Europe and had the best architects of his time build the new capital at the mouth of the river Newa. The Prussian King insisted on outlining the designs for his residence himself, Peter - quite Tsar und Carpenter - even personally lent a hand. We make you follow the traces of those two eminent figures and, en route, discover the tracks of other historical characters.